Will let you know how I get on mate. After some reading, it looks like that project is based on the Zvex Wah Probe...very cool stuff. I've seen a few other layouts for this that use 10n capacitors and 1x100n caps... apparently the trick to this pedal is from having the correct capacitor sizes. I did sub a 12nf for the 15nf capacitor... could that be it? I am a newb (well with like 30 builds under my belt) so sorry if these observations are dumb but that schematic only has 3 100n caps instead of the 4 in this layout. Also there is only 1 2n2 cap in your vero and 2x 2n2 caps in the schematic... i dont see a 2n2 cap in parallel with R9 from the schematic. I'd really appreciate it if you could take a look- I think i've got it... maybe the 2 100n caps that you have going to the 100k trimmer - maybe they make 200n- instead of the other 2n2 in parallel with the 100k R9 resistor from the schematic? as I said mine is operational- but there is definitely an eq and sweep problem. it is kinda acting like i'm turning my tone control up and down and but it is way more effective at affecting the lowest frequencies... kinda cool actually. if you can imagine a foot controlled tone knob- i've been getting into tone knob swells recently ala jim campilongo... digression is my favorite game. sorry, i'd greatly appreciate it if you could take another look, my newb eyes sense something isnt right, but I cant label it positively. Aah well spotted, I've posted the first version of the layout that I did which had a couple of values wrong (copy and paste without changing values). I corrected it but posted the old one! I'll change the layout now. Cheers for that. I verify this to be totally awesome, thanks again. Thanks, did you use the older layout with the 33K to Wah 2 & 3 or the newer one with a 470 ohm? I used a 470 ohm resistor. I also changed the 6n8 cap to a 5n6. i just redid mine a little bit according to this layout and now its sounding great! the only problem is that (no matter how I adjust the treadle- with it at the very bottom of the pot rotation with toe down is the best position right now) from toe up to toe down there is a large amount of inactive space. then the transisition from bass to treble is very quick. It's ALMOST there though. can you even get those in wah pots? So close to being perfect! If we want to increase the pot rotation resolution between bass and treble then the taper would need to be changed. If the transistion is late in the linear sweep then reverse log should give you more resolution, early in the sweep and a log may be more suitable. The W taper was designed for graphic equalisers and has a reverse log tape between the fully CCW position and centre, and a log taper between centre and fully CW. That may be more suited to this but I'd check the log or reverse log first. I'd really like to get this circuit working well... I just discovered the Analog Alchemy site where it shows calculations for tapered pots... I'm not really getting the percentage thing though... would this possibly be something that would work to get this taper down better? say i want to get rid of the trim pot and just have this output at full volume.... do i just sub a 100K resistor in it's place? or take my output from the 2n2 cap...? Exclude the trimmer and move the Output connection 1 row up. All a volume control does is dump some of the signal to ground, and so if you remove the part that does the dumping (pot or trimmer) and take the output from the cap just before it, it's like having a volume pot in the fully clockwise position. Excuse my ignorance, but how could I mod this to have a bass, Q, or any other controls? is there a way to make this wah more pronounced? I have build it,and i have a problem wiyh the volume. When i switch the wah,i have a volume drop,i lost almost half of it. I have the exact same issue! A volume drop even with trimpot on max output. Hmmm.. You guys could omit the trimmer and take the output from one row above where it is now. Schematic is verified and the layout checks out.. What transistors you used? Me too, a 2n5088. If I would take the output from one row above it still would be the same as turning up the trimpot, wouldn´t it? Yes it would - but omitting or snipping the trimmer altogether would stop part of the signal from getting dumped to ground through that 100K trimmer. Trimmer is added as a internal volume control and that isn't on the schematic - So i'm assuming that it's the cause for volume drop. Snip or 1M trimmer would be my next step. I´ll try that after christmas, I´m on the road right now. Thanks for the tip! I've try 1M trimmer,i have a slightly difference,not enough to work. So it seems that the last volume stage isn't the cause for low output. Hi again! Tried removing the trimpot and moved the output connection and had some more gain but not enough for unity gain. It´s a good sounding wha though. Maybe I will build a small booster after it if I can´t find another way to increase gain. Saddly, that may be the easiest option. This thing looks cool, so how would we connect it like a regular wah? Wouldn't a regula B100K pot die pretty quick functioning like this? Anybody knows how I can voice this to be a little bit brighter? I do like it, but I would like it to be a little bit brighter in the "down position". I built this one, but didn't really like it much. It just doesn't compare to using a nice inductor IMO. Not bad if you wanna save $25 bucks though. I just built this up from an old stripboard I built the Distortus Maximus on (that was a pain removing all the components and figured out which cuts were correct...!). Got it all put together and it gave me sound on the first test! The problem is, to get any wah sound I need to manually move the pot. Could any of these substitutions prevent the auto-wah sound? I also found that I had to flip my 2N5088 to get the volume levels right. Would that have anything to do with no wah sound? I dig how the wah sounds even though it isn't auto yet. Gives that sweet quacky out of phase sound. Very cool. Or am I just stupid and this thing isn't supposed to be an auto-wah? Well.. It is not an autowah. It's just a simple filter that varies with the pot. You should probably check out the EHX Bassballs or Nurse Quacky. Hahaha...I gotta start doing my research BEFORE I build these up...thanks for the info man! The pot I have is a split shaft, so I may try to mount the pot sideways and slip some kind of metal bracket in the split shaft and rig some kind of wah-enclosure. 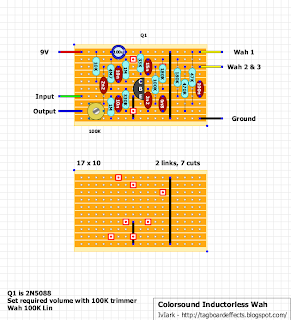 jacob, check out the bespeco weaper project on this site too I built it using an SK12 voume pedal encosure and Im sure it could be used for any type of wah. The mechanics of that particular enclosure make it perfect for quckly swaping out circuit boards and pots. Thanks Jim! I'll have to check into an SK12 enclosure! My wah is working inverted. aaaauuuuu from top to bottom. A few people have had this problem now so I think we need to get a definitive solution. Just desolder one end of the 47K resistor and see what affect that has on the volume. I think I'll update this layout anyway because the trimmer seems pretty pointless as it is if the circuit can't reach unity, but that 47K must be dumping some signal so it'll be interesting to see if that helps enough to get the effect to unity. Any update on the volume drop issue? The wah effect works great on my build but like others I can't get unity gain. I haven't tried lifting the 47k resistor yet but thought I would see if anyone had tried it or found a different solution. I took off the trim and did the 47k lift and it seems like it gets it at or very close to unity. The wah part still works fine so I think it will be great for how I want to use it. I know this thread has been dead for a while, but I fiddled with the circuit and found some cool stuff. The colorsound wah is amazing... easily my favorite wah. And these mods made it more usable for me. 1. I dumped the 47k resistor to ground. This gives the pedal a bit of a boost and a little more throat. I was able to cut some of the throat and get to near unity by using a 150k resistor, but I liked it better without any resistor at all. 2. I found that if I put in a 4n7 cap in place of the 100n it brightened up the pedal and gave it a much wider sweep while simultaneously keeping the low end. I actually put a on/off/on switch in with 100n/4n7/10n in place with the 4n7 bridging the center lugs... so I could have stock (dark), wide and warm settings respectively. 3. I put a switch to the input cap, on/on, so that I could have the stock 10 and 4n7... This brightens it up even more, which is useful for number 4. 4. I put an on/on sweep reverse switch, which wasn't super useful until I added all the 4n7s everywhere. I like this a lot, as it changes my playing a bit... breaks up my brain/playing ruts. and I got rid of the trim pot... not needed. Geof do you have any clips? I'm about to attempt a build with a crybaby shell? Any info you have will be useful. What you already have here seems quite usefull, too. The 47k resistor... You removed it? What exactly do you mean by dumped to ground? I'm starting to dig in and now I understand what you mean (taking it out completely). I'm working on a breadboard layout so I can experiment with this. I'd love to hear what yours sounds like! Did you use a Linear Wah pot? I only have Log on hand... I'll be posting more. Hopefully this will end up well enough and I'll make a little blog with more details. I'm looking at the "Nerd Club" schematic and there are a couple of really big differences in cap/resistor values. I used a linear and a log, I liked the response of the linear better, but the log did give it the feel of a brighter wah with stock settings. I actually think this one would benefit from an s curve pot, I just haven't gotten my hands on one to try yet. 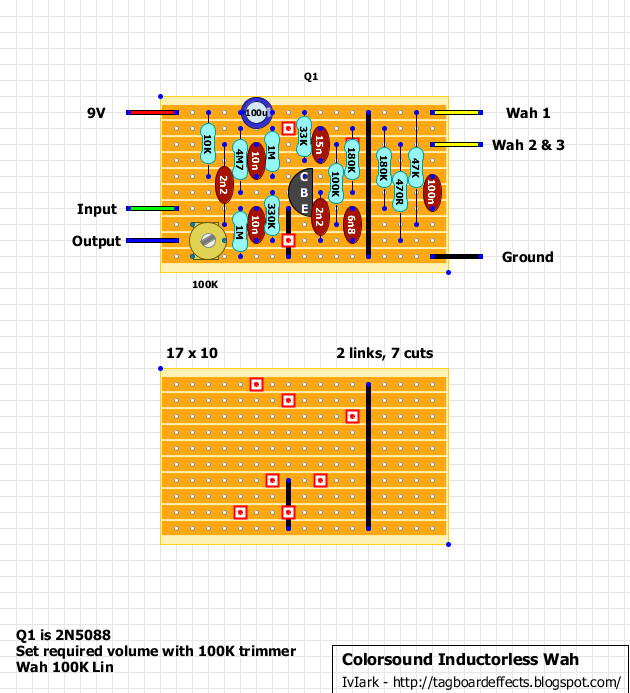 I've tried a couple of different colorsound wah schematics that I've found bouncing around on the web, and this one is by far the best. Some of the other ones feel like complicated tone controls, this one has the best wah sound and the most throat, which is something I love about the colorsound. Okay, I'll have to track down a linear pot to give it a try. This circuit is really fun to tweak, but it's overwhelming! :-) Do you have any recordings of yours? If not you should make some! I just did a blog / video demoing where it's at so far. I was tweaking again this morning (mostly with the output buffer I added). I still haven't played it through a real amp or with fuzz yet. I'm looking forward to seeing how that works. I built this wah and it sounds awesome! I made only 2 mods: I removed the 100K trimmer(and so the output was moved one row up) and I desoldered one end of the 47K resistor. Does this circuit shift the resonant peak or simply raise and lower the peak? After looking up twin T filters it doesn't seem like you can move the peak up and down a frequency spectrum, only make it higher/lower and sharper/wider. This circuit does a filter sweep when you step on it, that's what a wah effect is. Unfortunately I don't know the physics of it, but I built it and it and it worked. It distorted in places in the sweep, after some tweaks I reduced the collector resistor to 3k. Now there's no distortion and the sweep is still intact. I haven't compared it to a dry signal for volume jumps but I didn't have to turn anything up or down on the guitar or amp to be happy with it's level. I'm from Brazil and maybe my English is not so good. I know this subject is kind of old, but I have a few doubts. I built this wah and it did not work. There simply was no sound at the end. I reviewed all PCB tracks and components and everything is ok. I started this project by seeing a demo on youtube, the same one mentioned above by "mapexbob", that is "https://youtu.be/dIXF804x7yQ". There in that demo he says he removed the 100K trimmer and unsoldered one end of the 47K resistor and soldered line 2 with line 3 (bottom up). I then removed the trimmer also and this resistor since it does not make sense to leave a resistor with only one end connected in the PCB, and after analyzing what was left I resolved myself to change the output to line 3 as some people above reported and in this output I intend to put a pot for volume (100K A). Some of these things I wrote I saw other people post here, but I have many doubts because I do not understand almost anything about electronics. Another modification I'm intending to do is put a 100K B sliding pot into the WAH control as seen in "https://www.youtube.com/watch?v=NTk3zd20TVo.A"
The printed circuit board I myself make from a virgin copper plate through the technique of using iron perchloride. So what I did can be seen at "https://www.overpic.net/viewer.php?file=x7sjril847spgqg6zpais.png"
I would ask if anyone has any ideas that would explain well in detail because I do not understand virtually anything about electronics. Thank you very much in advance. Hi! Yes, I left one end of the resistor floating, as IvIark said (https://tagboardeffects.blogspot.com/2012/03/colorsound-wah.html?showComment=1393113788252#c7330600053239597120). Also resolder the 47k resistor and leave one end of it floating. Thanks for helping me. I will do the revisions again, including that of the 47K resistor. Maybe I even redo everything. At the moment I have no other 2N5088 to do a test and here where I live it is very difficult to find it to buy. So I ask: on a search site here in Brazil "https://www.electronica-pt.com/db/componentes.php" I get BC549 as equivalent for 2N5088, and this one (BC549) I have a new one. I just need to reverse the position because it has the pinout in reverse. Would that be right? As for the modifications I made to the position of the components on the board ("https://www.overpic.net/viewer.php?file=x7sjril847spgqg6zpais.png"), this was only to gain reduction in size because the box in which I intend to mount the wah is small. After new revisions and tests, I send news. For the transistor I used the BC549 too, because in my local electronic shop there weren't any 2n5088. Yes, you have to reverse the position of the transistor and it will work. I'm back from small health problems. My question now is this: could there be some kind of problem in simply replacing the volume trimmer with a 100K linear potentiometer? And would this modification have anything else to do? If anyone can help me, thank you in advance. No, there wouldn't be any problem, because the pot has the same function of the trimmer (they're both variable resitors). This weekend I'm going to redo everything and see what happens. I'll let you know. Only today I can give you news. I finished the wah and it is WORKING fine! I am very happy about it. Thank you very much for your attention. So, I used BC549, I removed the 47K resistor and added a 100K linear pot for volume control. I think my problem was in the solder that I think was not good and so I believe there were some cold welds. I bought and used a solder from another manufacturer. Well, see you next time and thanks again !!!! !